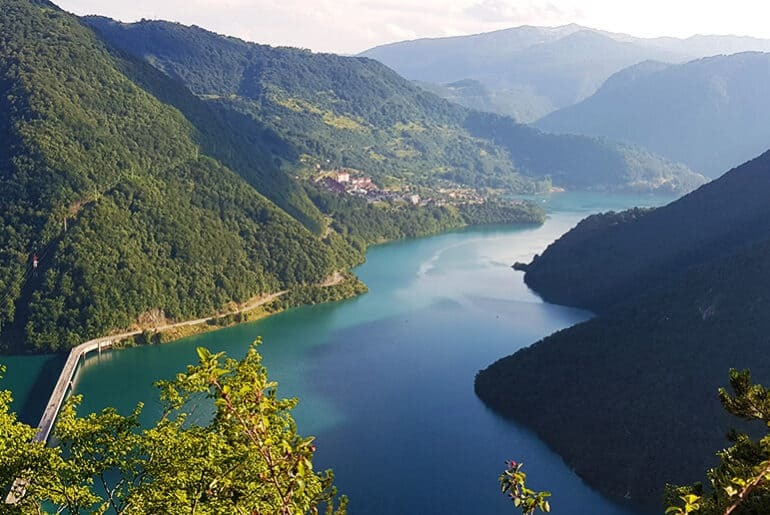 Pluzine: Piva Lake, Piva River and Too Many Tunnels! Arriving in Pluzine, we headed to the only campsite in town, Evergreen Camping. The site was under construction as they were about to lay a concrete slab for more campervans to park on, so the ground had been gouged and was rutted and full of rocks. We managed to get level, hooked up to electric and hit the restaurant for some dinner. The wifi didn’t reach the van and the toilets were far away, so not the best site, although we had a nice view of the beautiful Piva Lake. The next day was raining hard so we didn’t have much choice but to chill in the camper and after our adventurous road trip, we were ready to relax for a bit. When the rain let up a bit, we went for a walk around town and found that we could park for free at one of the restaurants. With the bathroom so far away, we were using the campervan toilet and shower and no wifi meant I was using my 3G. The more I thought about it the more it got my goat to pay €10 just for electricity when we actually don’t need it anymore, as the gas is working. So within 5 seconds, the decision was made and we started packing up. 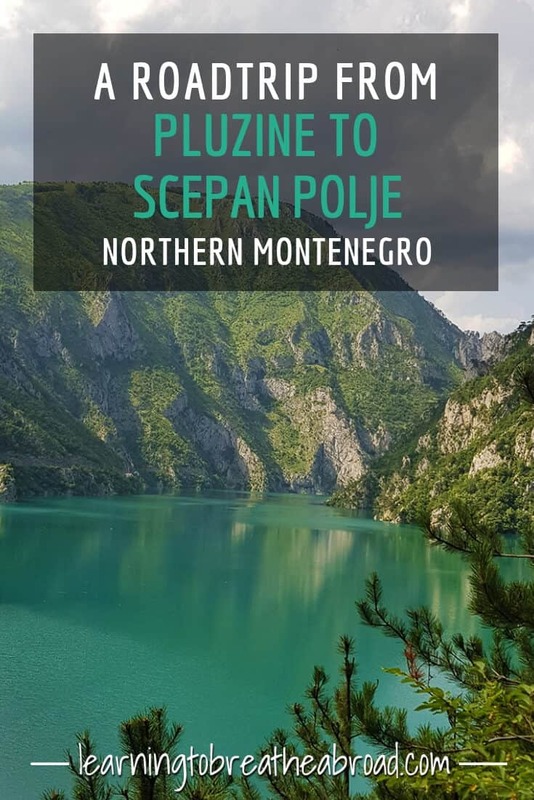 We wanted to do a boat cruise on the Piva lake, but they weren’t running in the rain, so with great excitement we left Pluzine, heading North to Scepan Polje to do some white water rafting. 71 tunnels later – yes 71 tunnels – over a mere 27km! !- we arrived at the Blue River Tara Adventure Centre. The road follows the meandering of the Piva River and the tunnels have been carved out of the rock on the side of the gorge. The road was not in the best condition and the tunnels had no lights, but they did have reflectors on the right-hand side which helped immensely. The Piva River has been dammed to create the lake and when we got to the dam wall, I couldn’t believe what I was seeing. On the left-hand side, we were almost level with the water, while the drop to the bottom of the valley on the right must have been about 3km. It didn’t help that Tai started pondering what would happen should the dam wall break while we drove across! My shattered nerves! 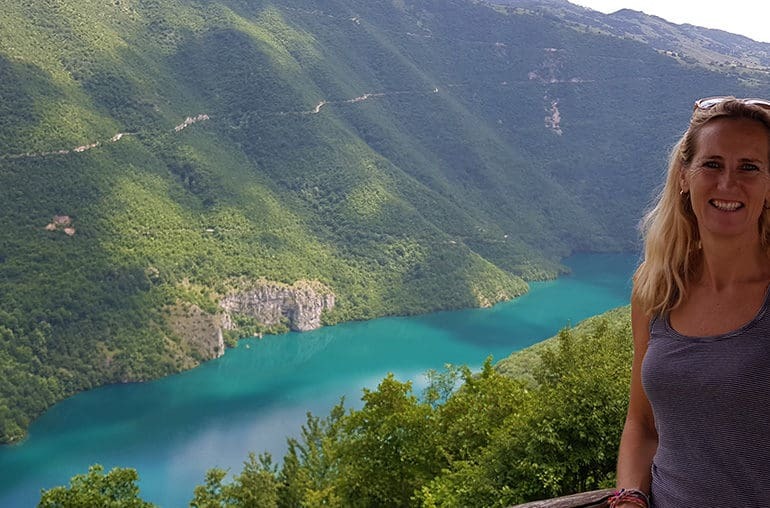 The Blue Tara River Company has a fabulous restaurant overlooking the Tara River and the bridge across to Bosnia and Herzegovina. The Montenegran Border was on our side of the river with the Bosnian Border across the river, so from the restaurant, we could watch the stream of cars crossing the border. The Tara River actually defines the border between the two countries and during our rafting trip, we stopped for drinks on the Bosnian side. The owner was very kind and let us park and stay in the field next to the restaurant. There were toilets and showers to use and I even got our laundry done! The wifi in the restaurant was excellent, so we got to catch up with some work as our rafting trip was the next morning. In Scepan Polje we wild camped at Blue Tara River. We went river rafting with Blue Tara River, so they let us stay overnight in their field. There are toilets and showers, the restaurant’s food is absolutely delicious and the view over the Tara River is breathtaking. Wifi in the restaurant is excellent and the staff is super friendly!! I even got to do my laundry for 5Euro. In Pluzine, we stayed at Evergreen Kamp camping. Not our best camp. There are some cement slabs for campervans to park on, but they had pallets of cement bags on them when we were there. I think they are going to cement the whole area for more campers to park. You have to walk past everyone on the patio of the restaurant in order to get to the toilets and the showers are even further away. There is free wifi in Pluzine, but it didn’t reach the camp area. 10 Euro per night with electric. A few days later we stayed in Pluzine again, this time at the Eco Piva Restaurant parking lot. The owner of the Eko Piva Restaurant agreed to let us stay overnight in their parking lot, as long as we ate supper in the restaurant. No services, just bathrooms, and wifi in the restaurant. 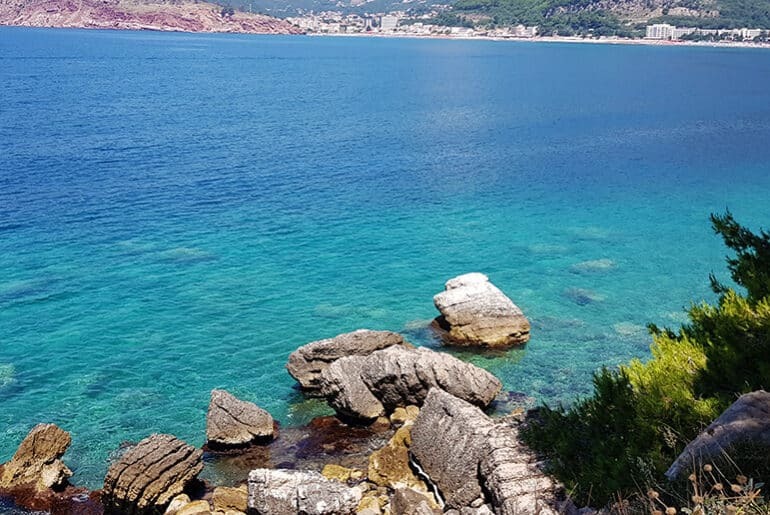 The natural beauty of Montenegro is so beautiful and the colour of the water in the rivers! You need to come see for yourself!